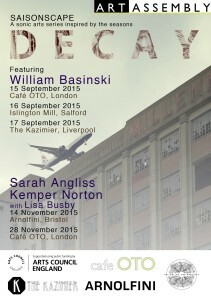 Saisonscape: Decay is the third installment of Art Assembly’s quarterly series investigating the seasons through music and sonic art. I’ll be performing a new set on the theme of London, infused with half-remembered stories from Edward Lovett’s Magic in Modern London (1925), eighteenth century Vauxhall Songbooks and other archival sources. This performance references amulets in London surgical museums, shape shifters, ritualistic magic, vardøgers, fever vans and more. Kemper Norton and Hoofus are also on the bill – and in the afternoon, Lisa Busby will be running a scavenger music workshop, followed by a live performance. Taking place in autumn, Decay reflects on the natural cycle of the season – leaf litter and organic material dropping to the ground and breaking down into one, renewing the soil with a rich and nourishing composition. For this edition of the series Saisonscape focuses on artists who use archives of field recordings, folk story and who layer instrumentation, objects and found sound. In their work, sounds, ideas and material mulch into new combinations, providing fertile ground for unexpected work and inspiring performance. William Basinski will be performing on other legs of the tour, in Salford and Liverpool.